From the Department of Neurology, Rehabilitation, Ophthalmology, Genetics, Maternal and Child Health (DINOGMI) (N.G., C.L., G.L.M., A.U. ), University of Genoa, Italy; Multiple Sclerosis Study Center (A.G., P.A. ), Hospital of Gallarate, Italy; San Paolo Hospital (M.P., F.B. ), Savona, Italy; and IRCCS AUO San Martino—IST (G.L.M., A.U. ), Genoa, Italy. In MS, discontinuation of some therapies may result in a transitory, possibly overwhelming, increase in disease activity.1,–,4 We report 2 cases of severe clinical rebound after fingolimod suspension occurring in 2 patients following pregnancy. Clinical rebound was defined as the occurrence of new severe neurologic symptoms together with a significant increase of new or enlarging T2-weighted or gadolinium-enhancing T1-weighted lesions exceeding baseline activity, on treatment discontinuation.4 The first patient was diagnosed with MS in 2005. In the subsequent 3 years, she experienced several relapses and progressive increase of MRI lesion load despite the sequential introduction of weekly interferon-β1a, thrice weekly interferon-β1a and then glatiramer acetate. Natalizumab (NTZ) was then started (EDSS 3.0, JCV antibodies negative status), resulting in no evidence of disease activity for the following 40 months. On seroconversion, NTZ was interrupted in August 2011 beacause of the potential risk of progressive multifocal leukoencephalopathy (PML) and fingolimod was started. In March 2013, fingolimod was suspended as disease was stable (figure, A) and due to desire of pregnancy and potential risks of fetal exposure to fingolimod.5 Lymphocyte count was 0.34 × 109/L. In April 2013, she resulted pregnant. In July (eleventh week of pregnancy), she abruptly developed quadriplegia and signs of severe cognitive impairment (EDSS: 9.0). Lymphocyte count was 1.54 × 109/L. One gram of methylprednisolone was administered IV for 5 days with partial recovery (EDSS 7.0). One month later, she developed locked-in syndrome (EDSS 9.5). 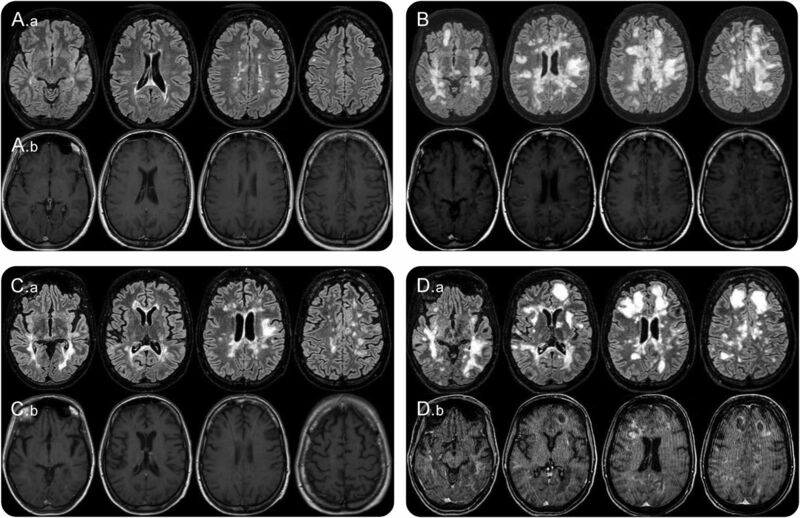 Brain MRI showed a dramatic increase of white-matter abnormalities with many gadolinium-enhancing lesions (figure, B). PML was excluded by CSF analysis. IV methylprednisolone followed by IV immunoglobulins were administered with no success. Plasma exchange was not considered because of the possible adverse effects on maternal hemodynamics and limited experience on pregnant patients with MS. On therapeutic abortion, she received IV cyclophosphamide (2 g/m2), improving clinically (EDSS 7.0) and radiologically (figure, C). One month later, her clinical condition deteriorated (EDSS 8.0) with worsening of brain MRI (figure, D). She was treated again with IV cyclophosphamide (1 g/m2), but a few days later, she developed septic shock and died. (A) Brain MRI performed on October 12, 2012. (A.a) FLAIR (FLuid Attenuated Inversion Recovery) sequence. (A.b) T1 gadolinium enhanced sequence. Routine MRI scan during fingolimod therapy shows some periventricular juxtacortical FLAIR white-matter hyperintensities with no gadolinium enhanced lesions. (B) Brain MRI performed on August 29, 2013. In the FLAIR sequence diffuse and confluent white-matter hyperintensities are found in both hemispheres in the periventricular and subcortical white matter, with the involvement of the “U” fibers. Many lesions show gadolinium enhancement. (C) Brain MRI performed on October 17, 2013. One month after cyclophosphamide IV administration. FLAIR white-matter hyperintensities are significantly reduced (C.a) and no lesion display gadolinium enhancement (C.b) compared with the MRI performed on 29th of August (B). (D) Brain MRI performed on January 3, 2014. A remarkable increase in the number and size of white-matter hyperintensities can be observed (FLAIR sequence, D.a) compared with the scan of 17th of October. New diffuse and rim gadolinium enhancing lesions are present (D.b). The second patient was diagnosed with MS in 1995 and was treated from 1999, first with interferon-β1a once weekly, then interferon-β1a 22 mcg 3 times weekly and subsequently interferon-β1a 44 mcg 3 times weekly. In 2004, because of insufficient disease control, she received 4 infusions with mitoxantrone 12 mg/m2 monthly followed by interferon-β1b. In May 2005, interferon-β1b was suspended when the patient resulted pregnant. In 2006, following childbirth, she started azathioprine and after a few months, because of disease progression, she was infused with 4 additional doses of mitoxantrone. In 2007, she started NTZ with no signs of disease activity for 28 months. In October 2010, NTZ was suspended fearing PML. In June 2011, she started fingolimod with incomplete disease control. In September 2014 (EDSS 3.0), she was again pregnant and therapy was suspended. Lymphocyte count was 0.7 × 109/L. Four weeks later, with a lymphocyte count of 2 × 109/L, she experienced severe left leg monoparesis and dysarthria (EDSS 6.0). IV methylprednisolone was administered with no results. Four weeks later, therapeutic abortion was performed. One week later, she presented with tetraplegia and anarthria (EDSS 9.5). She received high-dose steroids, followed by plasma-exchange and rituximab (two 1-g infusions 15 days apart) with radiologic and clinical improvement (EDSS 5.5 on April 2015). In May 2015, dimethyl fumarate was started with slow progression to EDSS 6.5 (January 2017). Suspension of therapies affecting lymphocytes trafficking to the CNS, such as NTZ and fingolimod, may rarely result in disease rebound. Compared with dramatic deterioration of disease following NTZ suspension, fingolimod withdrawal usually results in mild disease recrudescence,3,4 mostly controlled by steroids. In the reported cases, rebound after fingolimod suspension was rapidly devastating despite occurring during the early phase of pregnancy, a condition associated with a significant reduction of relapse risk. Possibly, abortion may have led to hormonal changes contributing to increasing disease activity similarly to what was observed in the post-partum. Thus, we suggest that similar to current protocols adopted for NTZ discontinuation, fingolimod suspension in patients with high-disease activity during previous treatments should be carefully monitored to detect early signs of disease reactivation potentially requiring immediate highly effective treatments. Moreover, early lymphocytes levels increase after fingolimod cessation could represent a warning sign possibly associated with their migration to the CNS.6 Whether these rare events are due to a possible change in the expression of key S1P receptors on immune or CNS target cells will require further studies.7 The possible outcome following therapy discontinuation should be carefully considered at the time of treatment choice in young women in child-bearing age, who need to be properly advised of possible risks of rapid disease worsening after treatment suspension. Author contributions: G. Novi: acquisition of data and study concept and design. A. Ghezzi: study supervision and critical revision of the manuscript for important intellectual content. M. Pizzorno and C. Lapucci: acquisition of data. F. Bandini: study supervision and critical revision of the manuscript for important intellectual content. P. Annovazzi: acquisition of data. G.L. Mancardi and A. Uccelli: study supervision and critical revision of the manuscript for important intellectual content. Disclosure: G. Novi reports no disclosures. A. Ghezzi served on the editorial board for Multiple Sclerosis International and served as a speaker for Merck Serono, Novartis, Genzyme, Biogen, Teva; consulted for Novartis, Biogen, Mylan, Roche. M. Pizzorno, C. Lapucci, and F. Bandini report no disclosures; P. Annovazzi served on advisory boards for Novartis, Genzyme, Teva, Roche, Merck-Serono, Biogen and received speaker honoraria from Teva Italia, Novartis, Genzyme, Merck-Serono, Biogen. G.L. Mancardi received travel funding and/or speaker honoraria from Bayer Schering, Biogen, Merck Serono, Novartis, Sanofi-Aventis, Teva; is an associate editor for Neurological Sciences; and received research support from Italian Multiple Sclerosis Society. A. Uccelli served on the scientific advisory board for Genetech, Roche, Allargan; received travel funding and/or speaker honoraria from Athersys, Biogen Dompe, Serono Symposia, Sanofi-Aventis, Tohoku University Graduate School of Medicine; consulted for Merck-Serono, Biogen Dompe; and received research support from Bayer Schering, Sanofi-Aventis, Italian Ministry of Health, Regione Liguria Progetto Limonte, Ricera Sanitaria Regionale, Italiana Sclerosi Multipla, Fondazione CARIGE. Go to Neurology.org/nn for full disclosure forms. The Article Processing Charge was funded by the authors.
. Pregnancy outcomes in the clinical development program of fingolimod in multiple sclerosis. Neurology 2014;82:674–680.
. Dysregulation of sphingosine 1 phosphate receptor-1 (S1P1) signaling and regulatory lymphocyte-dependent immunosuppression in a model of post-fingolimod MS rebound. Brain Behav Immun 2015;50:78–86.
. Rebound relapses after ceasing another disease-modifying treatment in patients with multiple sclerosis: are there lessons to be learned? JAMA Neurol 2016;73:775–776.